Even though ‘blockbuster’ describes how a movie is released not necessarily how it is made, there are inherent cinematic qualities we have come to associate with Hollywood blockbusters. At the very least, we expect a high-concept premise, moments of pure spectacle, conspicuous star turns, and extended action sequences. Released in the summer of 1993, Andrew Davis’ The Fugitive satisfies all these conditions, but it delivers so much more. It is an unusually successful movie adaptation of a classic American TV series, a gritty urban thriller, a mood piece, an engaging character drama and (much like its TV predecessor) socially critical. If anything, it is the blockbusting parts of The Fugitive that seem tacked on to an otherwise low-key entry in the annals of the Hollywood crime film. The movie meets its quota of special effects and stunts in the first half-hour, with the (at-the-time) breakthrough blue-screen train crash escape and famous waterfall jump falling within minutes of each other in the rolling action of its elongated opening. Once we’re out of the woods and back in the city (a geographically cogent Chicago, no less), the movie stresses the urban realism and rigorous detection of the police procedural for its remainder. Outwardly the movie’s ‘manhunt’ narrative structure appears astoundingly simple and its cat-and-mouse devices unthinkingly familiar, but in actuality it is a very intricately plotted film and requires attentive viewing to keep pace with its twists and turns, at least more so than my 11-year old self could adequately handle. As Dr. Richard Kimble, Harrison Ford gives the most unassuming and least showy performance of his long career and, though given joint star billing, Tommy Lee Jones in his portrayal of Marshal Sam Gerard channels the great character actors of Hollywood from Walter Brennan to J.T. Walsh not its transcendent stars. 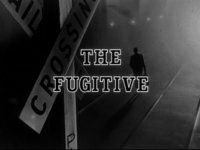 The Fugitive was on the cusp of a trend for blockbusters based on classic TV series (Mission: Impossible, Charlie’s Angels) but it took the heritage of its source material far more seriously than these later examples. The movie felt no need to sabotage or parody the original, but still thought carefully about what a movie based on this idea could do that a TV series couldn’t. Instead of the series protagonist’s ongoing, aimless wandering with occasional police intervention, the movie had Kimble determinedly returning to the scene of the crime to solve his wife’s murder closely pursued by federal marshals. Remarkably, the movie re-make never misses the point of the original, which was to reveal an America full of social injustice, corruption and vice that treats its best and most noble citizens as criminals. The movie even adds a layer of social criticism in its attacks on the avaricious commercial ventures of the privatised American pharmaceutical industry. The relentless pace does not prevent the writers from acknowledging the central dramatic tension of the series; Kimble’s dilemma of how to act in self-interest while helping others. And creator Roy Huggins would be proud that it is never done mawkishly or unconvincingly. What The Fugitive did so well was to create a more marketable version of a certain kind of slick thriller doing the rounds in the late ‘80s and early ‘90s that dealt with bourgeois professionals facing legal injustices and sinking into the criminal underworld. In this sense, Ford was the obvious choice since he starred in most of them, from Alan J. Pakula’s courtroom potboiler Presumed Innocent to Roman Polanski’s kidnap neo-noir Frantic. The last two thirds of The Fugitive are close to these movies in tone and imagery, whereas the action-oriented opening provides a more explicitly populist way in. It’s rare to have a summer blockbuster - certainly one this big - that is so centred around questions of character. Kimble’s integrity and selflessness (regarded here, rather intelligently, as both his major strength and weakness) control his fate, while Gerard’s resolute moral code both saves and threatens the lives of those around him. With minimal dialogue (especially Ford, who is virtually silent throughout) and seldom action, so much of the movie depends on mood. Invariably, it hits the right notes. Notably, the complicated feeling of the TV series ending is perfectly captured in the movie; relieved but inevitably haunted. 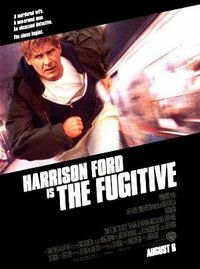 I don’t recall seeing a Hollywood blockbuster movie quite like The Fugitive, and certainly not since its release. At their worst, blockbusters offer the spectacle of themselves while going through the motions of what makes a passable movie. In The Fugitive, the tables are turned. The emphasis is on crafting a story, writing and performing compelling characters, creating a tangible mood, and adapting intelligently. Everything else is concession. Expectations of action, spectacle and stardom are placated rather than met; a popular disguise for a weightier proposition. The movie achieves exactly what the TV series did, incredible popularity without compromising complexity. Tom Steward is a TV blogger and film critic based in San Diego, California. He previously taught Film and Television Studies at several UK universities, including The University of Warwick and The University of Nottingham. Tom is currently acting in a series of horror shorts for Down-the-Block Productions and is having a one-act play produced for the company New Play Cafe. This article was published on August 10, 2014.